Flaming Lake was first released on limited quantity CDR in 2011 by Sulatron Records and now reissued on CD and double vinyl. 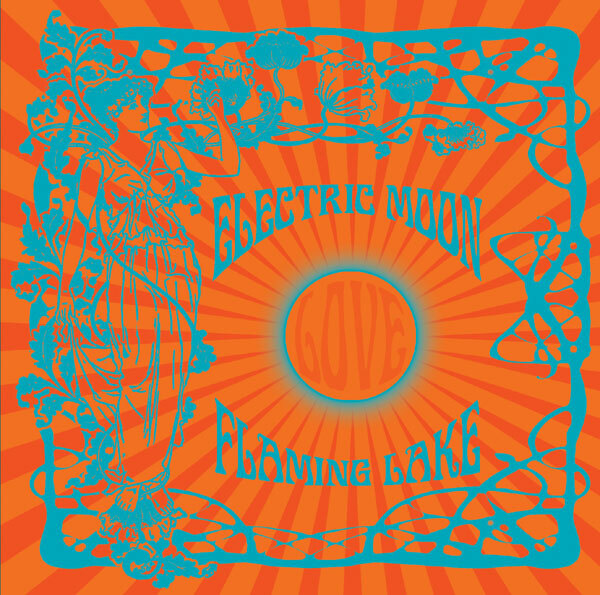 In true Electric Moon tradition these are all LP side long stretch out tracks ranging from 16-24 minutes. The Cosmic Creator (love that title) starts off slow and meditative, with a rumbling but peacefully flowing stoner fuzzed and pulsating spaced out Psychedelic vibe. I love how the volume, pace and intensity level gradually increase to the point of volcanic Space Rock explosion, while maintaining an uplifting floating through space feel. Sure it’s totally stoned and even a little demonic at times, but the easy paced drone and acidic corrosion are, nonetheless, a gentle and free flowing mind massage. And the fun continues throughout the set. The title track is similar but has a more throb rocking Stoner-Space groove and guitar solos that scream and melt into the void. Lost And Found Souls is the most overtly Stoner Rock of the set, though it’s soundscape doomy and we’re flying well beyond the Earth’s atmosphere. I love those shimmering guitar licks that pour off the strings like molten cosmic fuzz lava. And it’s loaded with killer effects that make it all sound like a sci-fi Armageddon soundtrack. Alternately, Burning Battenberg is, at least relative to the others, far more deep space acid drone drenched, opting for a stoned but intensely atmospheric groove. The pace quickens as the piece progresses and the vibe gets increasingly acidic with a cool blend of rhythmic rocking and hypnotic throb, culminating in a manic explosion of mercury bursting intensity. In summary, if you missed Flaming Lake the first time around then here’s your chance. If you like stoned improvisational Psychedelic Space Rock that’s all about the journey and the lines are blurred between beginning, middle and end, then Electric Moon should be your cup of tea. I never tire of their jams.